AODocs uses the Google Drive application programming interface (API) to automatically detect new content added to your AODocs folders. However, unexpected Google Drive errors can happen during the ownership transfer process and files may not be imported into AODocs. In this situation, the imported file isn't visible in the AODocs user interface and isn't owned by the AODocs storage account. To fix this issue, a super administrator can find the missing files and finish the import operation. 1. Open your library in the AODocs interface. 2. 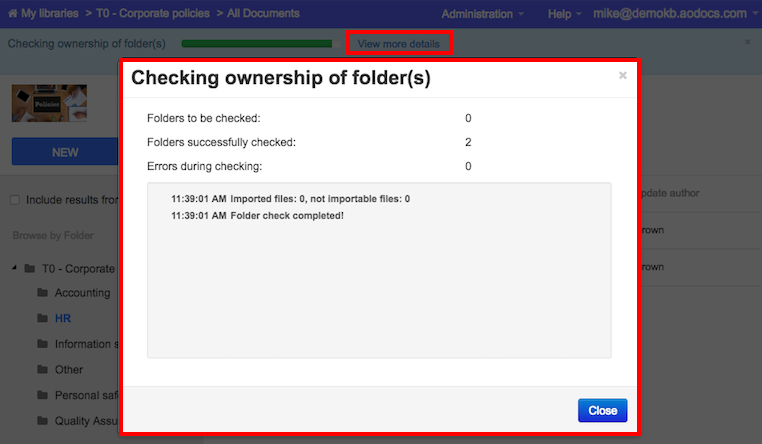 Press the arrow to the right of a folder and select Check ownership. A pop-up opens, warning you that checking the ownership might take time and make the other operations on your domain slower. Google Drive takes up to 5 seconds per file or folder to transfer the ownership. Tip: If you expect to find a lot of missing files, we recommend that you perform this operation during low activity periods (for example, overnight or during a weekend). 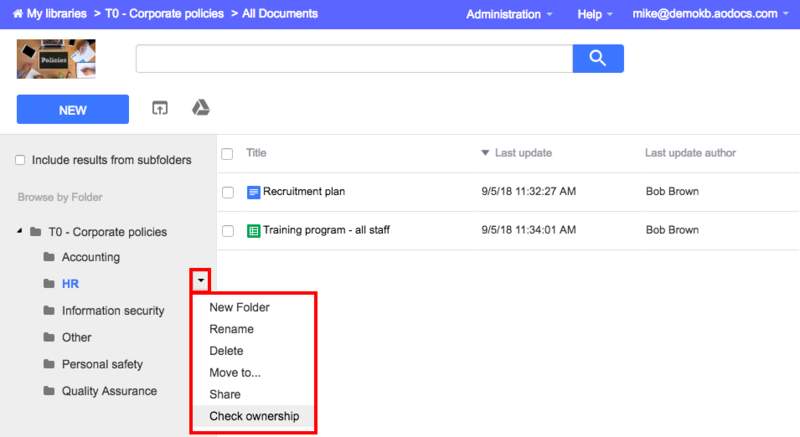 If you select the Check and fix the permissions as well checkbox, AODocs will check if the permissions on files and folders in Google Drive are consistent with the permissions defined in AODocs. If this is not the case, the permissions defined in AODocs will be applied to the items in Google Drive. A progress bar appears at the top of the screen. Learn more: Manage jobs.